« Book trailers – a good idea? 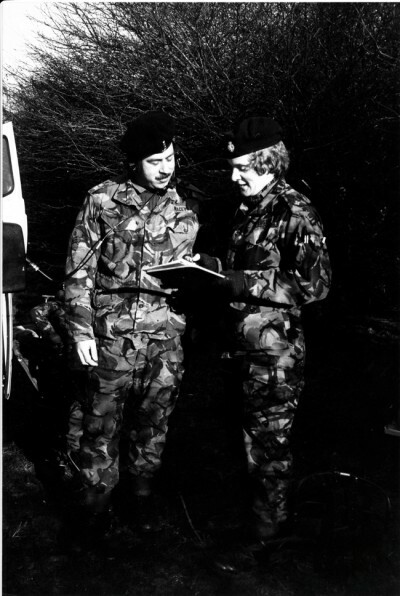 Earlier this week, I posted on my writing blog about my OU studies in history and how I turned my MA dissertation into a self-published book Military or Civilians? 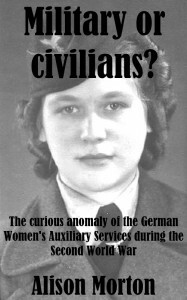 The curious anomaly of the German Women’s Auxiliary Services during the Second World War. 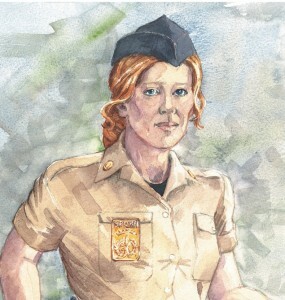 The experience of women serving in a uniformed service in wartime fascinates us. We’ve read many personal stories of women joining the ATS, the WRNS, the WRAF, the Air Transport Auxiliary, the SOE/FANY, and of women serving in ambulance, ARP and fire services in Britain during the Second World War. In Military or Civilians? I wanted to mirror that experience for similar young women in Germany. It had to go beyond Helga in the comedy TV series ‘Allo, Allo! or the brutal concentration camp guards. A number of the half million German young women who ended up working with the Wehrmacht (army), Luftwaffe (air force) or Kriegsmarine (navy) had been in National Socialist (Nazi) youth organisations in the 1930s, so took not only to the uniform but the discipline and sense of political community without a second thought. But most were ordinary young women with varying degrees of patriotism who joined up for different reasons, some naive, some wanting travel and adventure, some just to get away from parents or dead end jobs. One aspect of my study explores how the young women adapted, or not, and their varying attitudes to and feelings about their roles. Later in the war, young women were conscripted to meet a desperate shortage of manpower; they had no option to refuse under a totalitarian regime. Nazi ideology gave way to necessity, particularly in the last year of the war when these women became indispensable to the German war effort. But throughout, the status of these female armed forces’ auxiliaries remained questionable. Why did I decide to write my dissertation on this subject? Well, I’d spent six years in the Territorial Army (reserve armed forces) leaving as a (pregnant) captain. Training in the same way as regular soldiers with the same equipment and with a specific objective in time of war, it was disciplined and demanding, especially following the officer role. But it gave me a sense of purpose, of comradeship and doing something worthwhile. The experiences were unparalleled, if sometimes nerve-racking! Any uniformed service that takes its members into harm’s way usually has a preponderance of testosterone fuelled attitude. This seems a strange environment for women, but if an individual carries out his or her role to expectations, gender becomes irrelevant. My unit was a mixed one; we just worked together to achieve our objectives. So, with military services’ experience in my backpack, a curiosity about an unknown area of women’s history and a good working knowledge of German, looking at the female German experience in wartime forces seemed a logical choice for my dissertation. I received a distinction 🙂 🙂 and some very kind remarks from my tutor and the second assessor. More than that, I had deepened and widened my research and writing skills. My heroines serve or have served in the Roma Novan military. Ancient Roman society was a militarised one; the primary function of taxes and other state revenue was to sustain the military machine. All Roman citizens were required to serve at some stage, especially during the Republican period and if they wished to advance up the career ladder, the cursus honorum. The imaginary Roma Nova has struggled for survival though the centuries by mobilising both women and men to defend their values and preserve their way of life. So as senior members of their society my heroines, Carina and Aurelia, wear their uniform naturally. I wanted to write a society which was Roman and so military by nature and need, yet egalitarian. As seen in Military or Civilians? when push comes to shove, and you need personnel on the ack-ack guns, gender is irrelevant. But the added benefit of studying the Third Reich and women’s lives during that period is that I could draw heavily on the research for INSURRECTIO, the fifth Roma Nova book. The small state is threatened internally by a Roman nationalist movement led by a charismatic leader who wants to take power and remove women from all but subordinate roles in life (as per Nazi ideology). His objective is to bring in a severe male-dominated regime ‘to restore traditional Roman values’. You may well shiver in horror. Whether former Praetorian Aurelia can stop him is another question. Great post as usual. It was one of Hitler’s major errors of judgement that Germany didn’t recruit women in the same numbers and same areas as the British, particularly in the first years of the war. They were so entrenched in what they considered women’s ‘natural’ role in the church, kitchen and having children. Very short-sighted of him. But of course Hitler hadn’t had the opportunity of reading the Roma Nova books. It might have altered his opinion on women! Well, by 1944 there were 500,00 women in military roles, which I believe is roughly equivalent to British women’s services at the time, but it was a slow process. 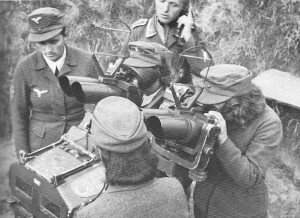 The Luftwaffe was more ‘enlightened’ as they’d recruited women earlier as observers and listeners in their early warning networks, but the number weren’t huge. The Soviets had the Night Witches, who flew bombing runs against the Germans. A fair amount of those who didn’t die during the war were heavily decorated with medals. During World War I, women were ambulance drivers due to the shortage of men. They also were switchboard translators known as “hello girls”. The hello girls wore uniforms and were subject to the same military disciplines as the men, and yet were dismissed as simply auxiliaries. It took decades before they were recognized as the military veterans they were. There have been several historical novels recently about the Night Witches as people are discovering increasingly more about women’s roles during war. I wrote this because I was intrigued by the ‘hidden’ yet well recorded story of the Helferinnen.